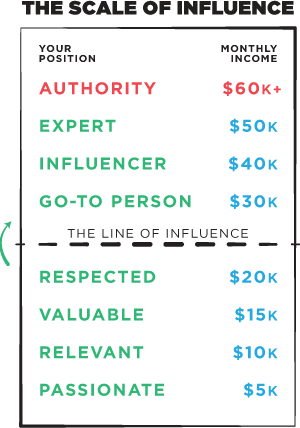 Getting beyond the line of influence. 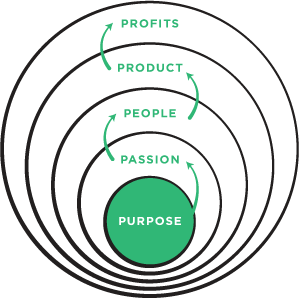 When you take a purpose-first approach to business, you start to play a whole new game. A game where traditional measures of success no longer apply. A game where the only currency we worry about is connection. And the only scoreboard we look at is profits. I blend online strategy with cutting-edge marketing, neuro-linguistic programming with intuitive guidance, and powerful coaching tools with business development techniques to help you create a business that rocks and a life that you love. This is all about creating a business which takes you from being below the line of influence to above it. It’s about creating your authority within both your industry and the world, so you can make a bigger difference, and make bigger profits. Imagine a business built from your passion, dealing with people you like, and the freedom to work wherever and whenever you want. When was the last time you felt truly happy in your business? The last time you crossed off a huge goal from your list? The last time you knew exactly what to do next? You can have more than that. You can break the mould. You can stop chasing profits, and have them chase you as you spend your time focusing on the things that will fulfill your purpose and your passions. Flip business on its head. Traditional business takes a top-down approach. It looks for gaps in the market-place and Unique Selling Propositions. It is built on years of work and incremental growth. It reeks of effort and misery. I take a different approach. People before profits. Huge profits. Focus on the things that fulfil your sense of purpose and bring you the greatest love first. Then, with a people-first mentality create products, that offer real value to those who like you most, and actually feel proud of your business and your profits. To work. To put yourself into the spotlight. To overcome the limitations that have held you back in the past. To love what you do. Don’t expect to get beyond the line of influence by working only 2 hours a week. Don’t expect that you can do nothing and I won’t let you know about it. Eventually you will be able to. But not during our time together. Traditional business models (particularly for infopreneurs) tend to have little “stackability”. When we work together, everything you do builds on the actions you’ve taken previously to increase your authority. We build an Authority Empire that is not reliant on continually pushing for new clients. Instead, our goal is to pull in those we can truly add value to, further reinforcing the position you are building in your industry. You may be a current business owner, you may be running your own practise, you may have an idea that you want to send out to the world. • You want to improve the world. • You are not really interested in making any change. I help you to create a vision that inspires not only yourself but the people around you. I help you destroy limiting beliefs that have been holding you back from the success you deserve, and replace them with beliefs of possibility and abundance. I then give you the exact systems and strategies to take your business from where it is today, to the success you have been dreaming about.